Supporters of the Export-Import Bank claim that it is a necessary tool to promote US exports and export-related employment. However, researchers in Washington have long been skeptical that export subsidy schemes like Ex-Im assistance meaningfully affect national exports and related employment. Examining the data is key to understanding just how limited Ex-Im’s influence is on US exports. This week’s charts use data from the Annual Reports of the Export-Import Bank from FY 2009 to FY 2013, the International Trade Administration, and the US Census Bureau. The charts display the total value of US exports and total number of export-related jobs from 2009 to 2013, along with the proportions of exports and export-related jobs the Bank claims to have influenced in its official reports. The data reveal that the Export-Import Bank only affects a tiny portion of total US exports and export-related employment. The first chart provides a snapshot of the cumulative figures for export value and export-related jobs for the past five years for which data are available. 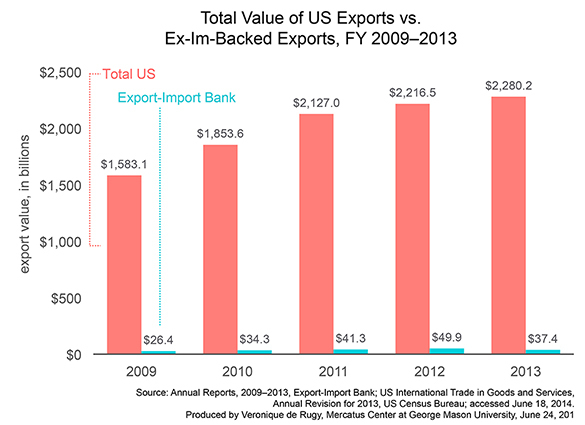 On the left, the cumulative sum of the value of all US exports from 2009 to 2013, as reported by the Census in the 2013 Revision to US International Trade release, is displayed along with the portion that Ex-Im claims to have assisted in its records. The Bank claims to have influenced $189.3 billion of the over $10 trillion in US exports during this time, or just under 2 percent of total US exports. 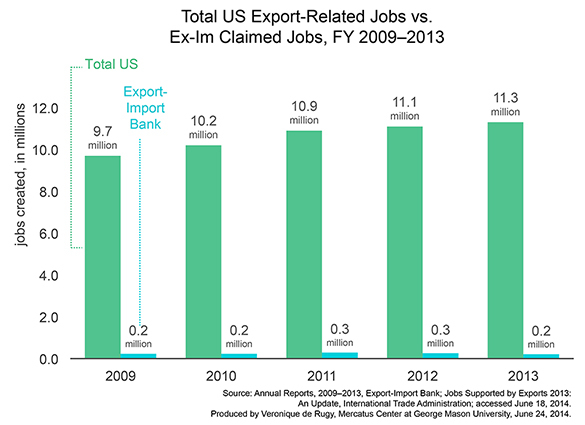 On the right, the cumulative sum of all export-related employment in the United States from 2009 to 2013, as reported by the International Trade Administration’s (ITA) “Jobs Supported by Exports 2013” release, is displayed, along with the portion of jobs claimed to be created by Ex-Im in its annual reports. The Bank claims to have supported or created 1.2 million of the roughly 52 million total US export-related jobs reported by ITA from 2009 to 2013, or only 2.3 percent of total export jobs. The second chart displays the total export-related job numbers reported by ITA and Ex-Im for each year as a time series. 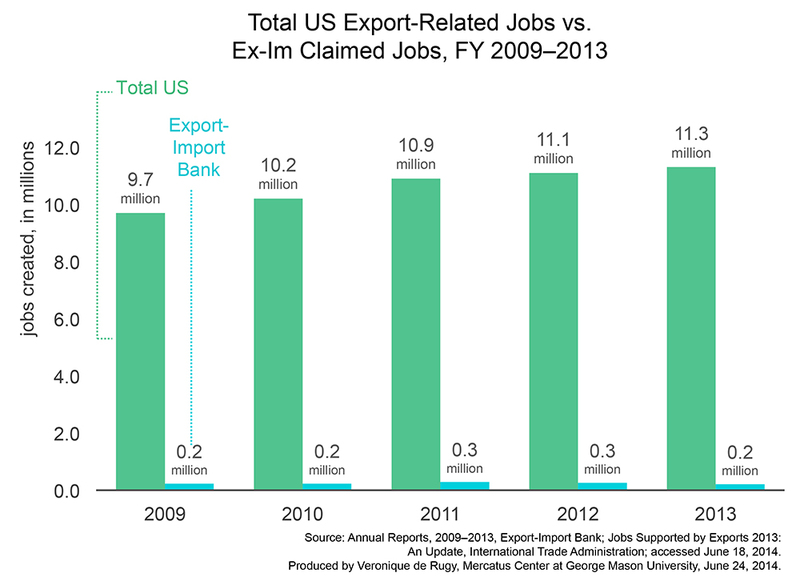 The green portion represents total export-related jobs in the United States and the blue portion represents the jobs claimed by Ex-Im each year in its annual report. We can clearly see that the Bank’s role in promoting export-related employment over the past five years has been miniscule. For instance, in 2013, the 205,000 jobs that Ex-Im claimed to create or support represent only 1.8 percent of the 11.3 million export-related jobs reported by ITA for all US exports. The third chart displays the total value of US exports reported by the Census and Ex-Im for each year as a time series. The pink portion represents total value of all US exports and the blue portion represents the value of US exports that Ex-Im claims to have assisted each year in its annual report. Again, we see that the Export-Import Bank claims to have affected a vanishingly small share of total US exports since 2009. Most recently, in 2013, the $37.4 billion in export value that Ex-Im claimed to have assisted represents only 1.6 percent of the roughly $2.3 trillion in value of total US exports reported by the Census. Interestingly, the total value of US exports actually increased from 2012 to 2013, while the total value of Ex-Im-backed exports decreased during the same time. While these figures may demonstrate the relative insignificance of Ex-Im activity in total US exports, it should be noted that the Bank’s questionable methodological approaches may actually overstate its role. A May 2013 report from the Government Accountability Office (GAO) criticized the Bank for concealing the many methodological weaknesses that underlie its reported jobs numbers. The Bank does not distinguish between full-time, part-time, and seasonal employment; it does not control for selection effects; and it does not consider the unseen counterfactual question of how many jobs would have existed without any intervention at all. All these factors resulted in the GAO warning that Bank-reported numbers may seriously overstate Ex-Im’s true job impact. In spite of these limitations, the Bank’s data provides at least some measure of its irrelevance in the broader US export market. The argument that the Bank is a critical tool to promote US exports and export-related jobs simply does not hold water. 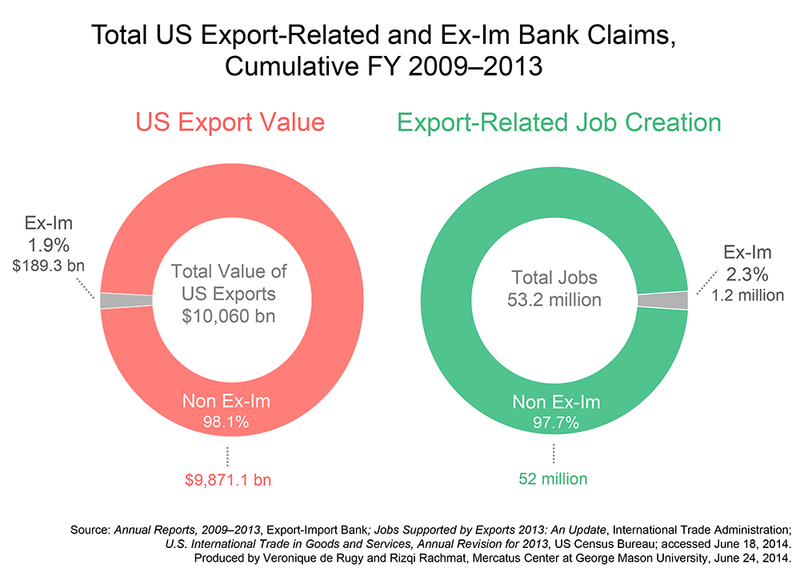 The US Export-Import Bank can at most claim to have assisted roughly 2 percent of total US export value and export-related job creation from 2009 to 2013. Ex-Im supporters might be able claim that the Bank’s support is critical to the private, politically connected corporations that benefit from government assistance, but they would find it difficult to claim that US exports rely on its activities.